The D9 Conference is the venue bringing together one of the most influential people in tech and just mere hours ago it welcomed one of the most controversial CEOs in the history of the mobile industry - Nokia’s own Stephen Elop. The Finnish company has led the industry in terms of sales for years, but after the trend-changing announcement of the iPhone in 2007, it’s sliding on an increasingly steep downward spiral. Nokia has lowered its second quarter outlook and is in the process of updating its view for the whole year as sales of Symbian-based smartphones are taking a nosedive. The salvation? Stephen Elop confirmed expectations that a Nokia Windows Phone handset is set to arrive in the fourth quarter of the year the earliest and by fourth quarter Nokia hopes to get it to the market not earlier than at the end of December. But denying those rumors didn’t do much good to the company as after Murtazin’s tweet feeded investors’ hope about a way out and Nokia stock stopped sliding, the subsequent denial of the rumor put the shares back on the downward slope. In the two days after Nokia re-evaluated their quarterly result, shares of the company have sunk 19.3%. 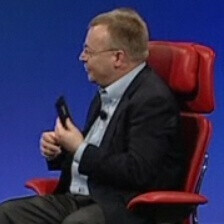 What follows below is a must-watch video of Stephen Elop’s take on Nokia’s transition process and acquisition rumors. But what's even more interesting is the fact, the chief executive refers to his own company, Nokia, a couple of times as "they" alienating himself from the company when referring to the reasons behind Nokia's poor success in the States. On one hand, it's true that Elop wasn't Espoo's CEO at that time, but on the other hand this lack of perspective is puzzling. Oh and did we mention that he teases one of Nokia's upcoming Windows Phone handsets? Check out the interview below for all the details. Of course he's going to deny it, if the shareholders found out that he was purposely devaluing Nokia so Microsoft could acquire Nokia, they would have him ejected as CEO so fast his head would spin. How can he say that the rumors are baseless? 1) He worked for Microsoft 2) He's ditching Symbian for WP7 3) He sold his Microsoft shares for a large portion of Nokia shares after the price dropped dramatically 4) He's done nothing to make the shares go up 5) He's having low-end WP7 phones come out at the end of the year 6) He went with WP7 instead of Android, when Android would be a smarter move as people are more likely to adopt that than WP7 7) It's being referred to as an alliance between Nokia and Microsoft Nokia is the biggest phone maker in the world, Stephen Elop was put there purposely so WP7 would have a competing chance with iOS and Android. And if Microsoft doesn't buy out Nokia by next year, I'll be surprised. 1) He worked for Microsoft - True 2) He's ditching Symbian for WP7 - True 3) He sold his Microsoft shares for a large portion of Nokia shares after the price dropped dramatically - He had to legally. Seriously, if he was nokia CEO and kept his MS shares and didn't buy nokia ones there would be a huge outcry. 4) He's done nothing to make the shares go up - true (though i don't think Symbian was increasing share price or gaining lots of customers either) 5) He's having low-end WP7 phones come out at the end of the year - He's not, He is after pushing low and high end WP7 devices, just as there are a range of Symbian devices. If there's a consipracy, this isn't it. 6) He went with WP7 instead of Android, when Android would be a smarter move as people are more likely to adopt that than WP7 - True he adopted WP7 rather than adroid, but what if with MS he cold get features in the os core and a good deal generating more revenue from maps and other nokia services, while google said, yes, be an OEM with same deal as HTC and Samsung? WP7 may be riskier, but nokia has a good seat at the WP7 decision making table. 7) It's being referred to as an alliance between Nokia and Microsoft - It is. This doesn't mean much other than they are working closely together, and more closeley than MS is working with other makers. If nokia is bought by MS i will be suprised - windows phone looses a lot of value, not to mention sales if MS buys a hardware maker and brings it in house. They would be surrendering the OEM market to android if they did that. The deal they have is good, and nokia can make millions of phones using S40 at the low end and support symbian and relase symbian devices and Maemo6/Meego devices if they wish. MS doen't have a use for the "dumbphone" section of nokia, or Nokia Siemens Networks, and will do much better with multiple makers selling windows phones.